I wanted to express our gratitude for all that you have done for the employees in the Fluor Long Beach Office. Not only have you been a main exhibitor at our Annual Health and Wellness Fairs, but you have received remarkable feedback from employees who have attended these events. You have become a widely requested presenter in the Long Beach Office. Many of your event attendees have become patients! This number continues to grow with the wonderful results employees have experienced and the excellent service from your staff. 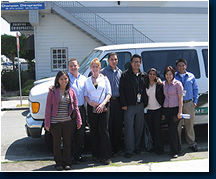 One group of employees has pioneered a van-pool group to visit Champion Chiropractic on their lunch hour! You have by far lived up to your stellar reputation in your industry. Thank you again for all that you continue to do for our employees. Human Resources, Fluor Enterprises, Inc.